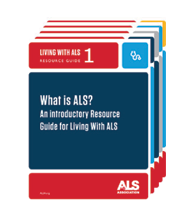 The ALS Association's Living with ALS Resource Guides were created because of the rapidly expanding information and research in the clinical management of ALS. These cornerstone educational materials were designed to inform and educate people about ALS in a comprehensive and easily understood format. They address many of the common concerns and issues that face people living with ALS. 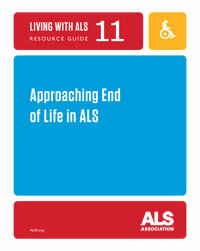 Reading all 11 resource guides at one time can be overwhelming to persons with ALS and their families. We highly recommend that you only access the information that pertains to your present circumstances. 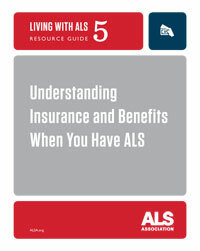 Once you have reviewed one or more of The ALS Association's Living with ALS Resource Guides, you may have questions and you may want to know where to go for even more information. Feel free to contact The ALS Association via our toll-free number at (800) 782-4747 or e-mail alsinfo@alsa-national.org. With the vast network of ALS Association chapters, certified centers and clinics across the nation, there is likely an ALS Association affiliate in your region to help you. Use our locator tool to find an ALS Association affiliate. 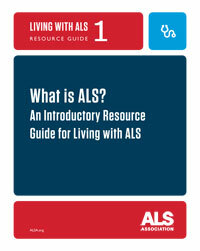 This resource guide provides an overview of ALS, what it is, and how it affects your body. 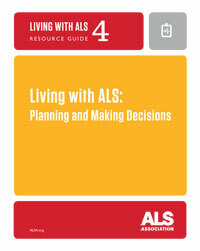 It provides information on what kind of resources are available to help you deal with ALS more effectively. 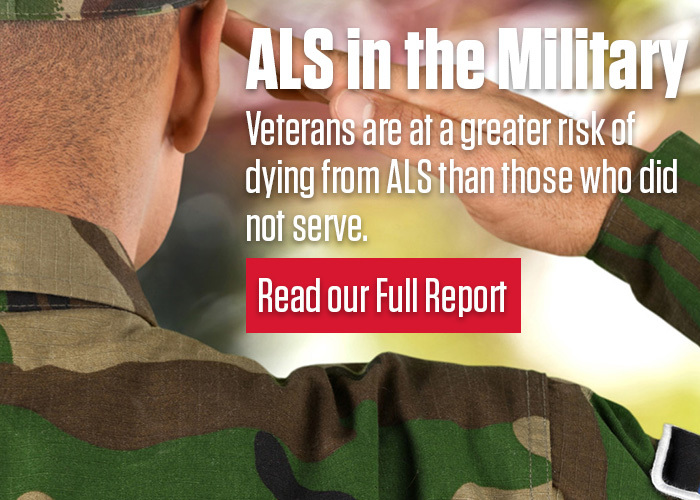 This resource guide addresses the psychological, emotional, and social issues that you must face when your life is affected by ALS. 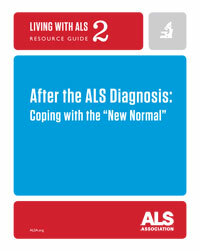 It provides information on how to cope with the many lifestyle changes and adjustments that occur when you live with ALS. 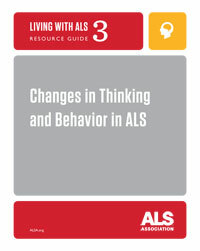 This resource guide addresses how thinking and behavior may be affected by ALS and how these changes can impact disease course, symptom management, and decision making. This resource guide reviews areas where careful planning and decision making will be required and will provide you with resources to help you and your family plan for the future. This resource guide provides strategies and helpful hints to better navigate health insurance and benefits. While understanding insurance and benefits may feel overwhelming, the guidelines outlined here should help simplify the process for you. 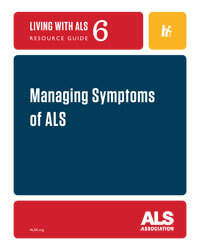 This resource guide discusses a variety of symptoms that may affect you when you have ALS. As the disease progresses, various functions may become affected and it is helpful to understand potential changes so that you know what to expect and how to manage these new changes and symptoms. 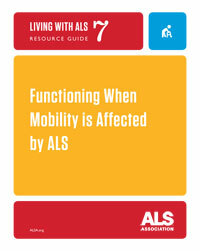 This resource guide covers the range of mobility issues that occur with ALS. It discusses exercises to maximize your mobility, as well as how to adapt your home and activities of daily living to help you function more effectively. 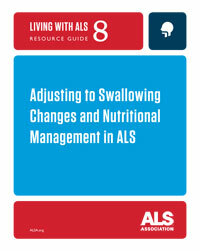 This resource guide will help you understand how swallowing is affected by ALS and what you can do to maintain nutrition for energy and strength and to keep your airway open. This resource guide covers how speech can be affected by ALS and explores a variety of techniques, technologies, and devices available for improving communication. By maintaining communication with others, you continue to make a significant difference in their lives, while retaining control of your own. 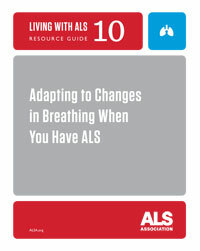 This resource guide explains how breathing is affected by ALS. Specifically, it will teach you the basics of how the lungs function, the changes that will occur, and how to prepare for the decisions that will need to be made when the lungs need maximal assistance. This resource guide examines thoughts and feelings about dying and end of life. Approaching end of life is difficult and support is critical to help sort out feelings, expectations, and plans. By talking to friends, family, professionals, and planning and communicating your wishes, you can help prepare for the best possible end-of-life phase.